This dazzling Aqua Terra ladies' watch features a sparkling set bezel, and a dial presenting a wave design featuring no less than 138 dazzling diamonds. An 18ct rose gold case perfectly compliments this glistening model, with co-ordinating hands. 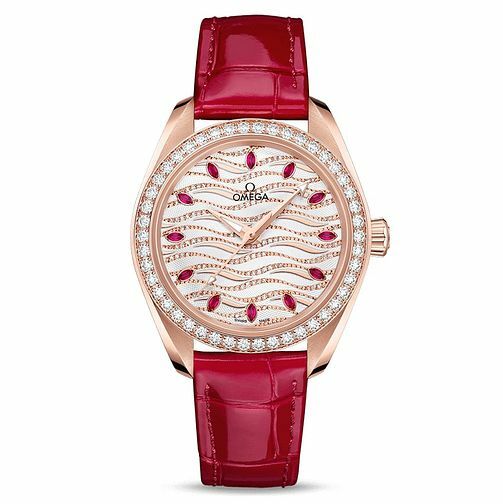 The hours are marked out with 12 maquise cut red rubies, this model is no exception to Omega's upstanding reputation for quality. Complete with a rich red leather strap, a stylish timepiece for the sophisticated lady.